A solution for EMI in sensor circuits is filtering and another solution is shielding. Filtering is used to attenuate the RF signal before they penetrate the sensor circuits. We normally use pi- section filters. It consists of an inductor element (RF choke) and two capacitors. It is normally installed close to the connector. In usual cases common mode and normal mode EMI filters are used to reduce conducted EMI noise. But the filters have reactors with iron cores which make the filter larger. The source shielding procedure is shown in the figure below. Here the source is shielded to reduce the effect of Electromagnetic Interference. So the EMI cannot propagate to the receiver circuits. 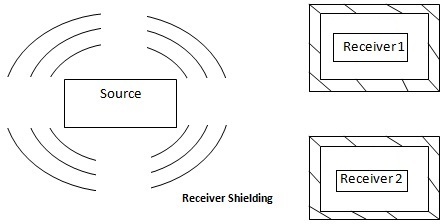 In the receiver shielding procedure, the interferences from the source will not reach the receiver as it is shielded. So unless a crack or any other damage occurs to the shield, the EMI can be extremely prevented. Usually on Integrated circuit, bypassing or decoupling capacitors are used on each active device to reduce the effect of EMI. Usually Shielding is a good technique if others are failed and shielding can be expensive due to the use of conductive gaskets. The majority of the digital equipments are designed with metal or conductive coated plastic cases. Usually the quality of shielding increases with the type of metallic cabnet used for shielding. All the data or signal carrying cables are also shielded with the help of shielding mesh around the main conductor. Hence the shield restricts the EM field which in turn avoids signal degradation. Double shielding is same as single shielding except the fact that here two shields are used. We know that a common method to avoid penetration EMI is to use a shielded metallic case. But breaks in the shield can lead to leakage EMI. So a method called double shielding can be used to reduce both penetration and leakage EMI. So even if the EMI enter the first shield, the second shield can prevent it from entering the sensor circuit. 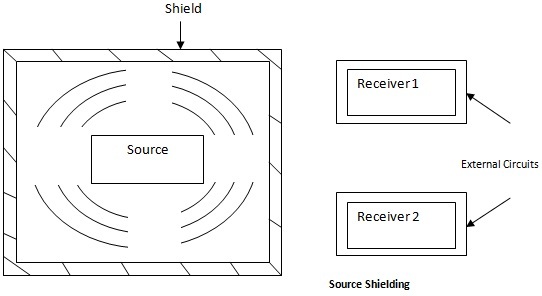 This method of using two shields at a time is called double shielding.